different choice of meat either: beef, turkey, lamb or chicken. 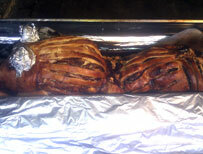 "whats the difference between a hog roast and a spit roast" ? Our machines are made from stainless steel and are 4ft long 1.5ft wide they have large pneumatic tyres enabling them to handle any surface and can be used indoor or outdoor. When the cooking process is complete (8 hours cooking time for a 65k pig) the doors are removed and the hog is raised up so the chef can easily cut the meat and guests can view the pig as it is carved. Each machine has it's own gas certificate and is serviced every year. Our machines are used regularly and are replaced every two years. We provide a wide range of options to the general public and businesses across the North of England. If you have any special dieatry requirements or need vegetarian options providing this is not a problem just give us a call and one of our advisors will arrange it for you. No matter what event we are catering for we always have the highest health and safety standards, we work closely with local authorities to ensure our standards are always up to date. Our staff have a minimum level 1 hygiene certificate as well as in house training. 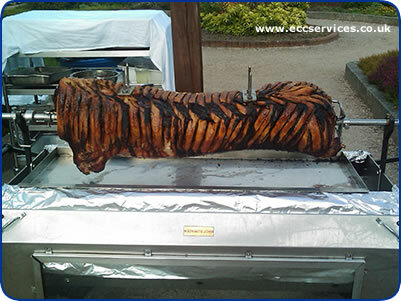 We provide a high standard of service at every event and customer satisfaction is our top priority but as you can see we are very competitive with our prices, we buy our pigs at wholesales prices and this enables us to provide you with the most competitive price around. chef's, services staff, hog + machine, buns, apple sauce, stuffing, sauces, plates, napkins, knives, forks, service tables, table covers - basiclly the full package. At the end of the event our staff will clean up the work area and take away all the rubbish leaving you and your guests to enjoy the rest of the day.